Beautiful, Non-Smoking chalet/cabin with good access on side of mountain overlooking picturesque Stecoah Valley and the mountains beyond. This is a beautifully appointed two bedroom/2bath cabin, containing all amenities necessary for a great relaxing stay. Wonderful views from the spacious deck. Everything is furnished for your stay and enjoyment. Places nearby: Fontana Lake and Dam, Great Smoky Mountain Railroad, Stecoah Valley Center, Appalachian Trail, Tsali Recreation Area, Joyce Kilmer Memorial Forest, Great Smoky Mountain National Forest, Cherokee, Bryson City, Robbinsville, Cherohala Skyway, Tail of the Dragon at Deals Gap. Antique Auctions, Nantahala Gorge whitewater rafting and kayaking, Horseback riding, Mountain music and concerts during summer season at Stecoah Valley Center. Good access roads. Beautiful views. Peaceful surroundings in a safe and secure area. Retired USAF Officer who loves the mountains, having been raised in Montana and now residing in Alabama. I love animals and permit the cabin to be pet friendly without an extra deposit or fee. Discovered this property after I retired and loved the rural area and beautiful views from the wonderful deck. This is a place to go to be totally relaxed and SORRY for a few days. (2) Free long distance within US and Canada. No international calls permitted. lots of items remain in the cabin. Guests are welcome to use any and all items. Kitchen remodeled in 2008 with new stove, dishwasher, microwave, disposal and countertops. Table leaf located in 2nd bedroom closet. (2) Directv subscription included with tv in den and master BR. large deck overlooking Stecoah Valley. Very comfortable relaxing cabin with absolutely stunning views. The cabin was clean and welcoming. We had an extremely relaxing weekend and will definitely recommend to everyone. Thank you so much for sharing your home. Centrally located but off the beaten path. Felt like home and the owner was very accommodating. Thanks for the kind words. We attempt to make the cabin very accommodating and relaxing for our guests. Very scenic and clean cabin. We enjoyed our stay and will hope to return someday. Beautiful property - peaceful and relaxing! We loved our stay at this cabin. It was very family friendly with a big open living room for our kids to play in. The deck was beautiful to hang out on - and had the amenities to take care of the mosquitoes which was greatly appreciated! It is conveniently located to the Smoky Mountains NP and lots of trails! Overall, it was very comfortable and relaxing - I highly recommend staying here! 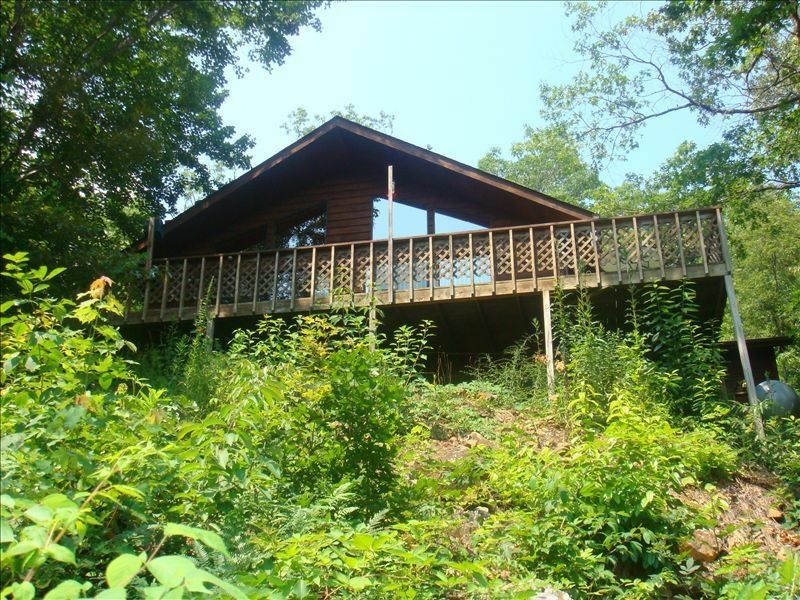 Great location...close to Bryson City and all of the great hiking it had to offer! The folks at BC Outdoors turned us onto some really unique attractions on the hikes we took. The accommodations were nice and had everything we needed for our stay. We will definitely return...way too many things to do in just 5 days! We had a wonderful week in the cabin. The view is amazing!! The cabin was well stocked and comfortably furnished. The location is convenient to Bryson City, Murphy, and Franklin, we visited them all during our stay. We will definitely be back! Cherohala Skyway, Blue Ridge Parkway, Nantahala Gorge Whitewater Rafting, casino in Cherokee, fishing, boating, Fontana dam, Railroad ride, Tail of the Dragon.